Here are two knives with advertising but not any SAK. The small flat one is actually a Zippo knife. Is it a 1980s knife? Let me know if you have information on it. It is a nice construction that is fun and interesting. It is not only SAKs that are used for such a theme. It must have been a competition on this market. I have seen some German and other countries with an ok quality for such knives. I have seen some knives from Japan with a more versatile or SAK looking types with a quality that is from low to medium. 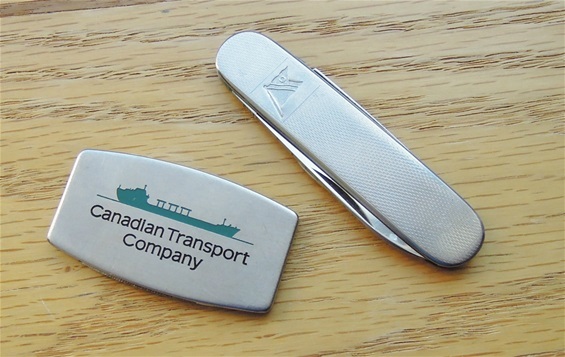 Many times it is knives with just a maritime advertising and you can find the same knife with advertisings for many other situations or land based companies or just the civilian market. It gives a solid impression with a good quality knife with advertising like the real SAKs have. It can be a very large field for a collector of maritime theme knives or advertisings for shipping. This has been done for many decades. The Fred. Olsen Lines knife do not have any color on the flag anymore and it is not stamped with a maker country. It is probably a Solingen knife and could be a 1970s knife. I am not sure at all about this and let me know if you have information. The handles seem to be steel but I do not believe it is steel Guilloche. The quality of this knife is ok.